Executive producers Tom Hanks, Steven Spielberg and Gary Goetzman, who brought the Band of Brothers miniseries, will be premiering The Pacific miniseries March 14 on HBO. Along with HBO, Comcast is giving its subscribers exclusive On Demand content including a scene from The Pacific, interviews with the producers, and sneak peaks into the making of the series. Comcast is also loading up a Band of Brothers episode every week as a primer for the premiere. The Pacific (which will be available in HD) follows the intertwined real-life journeys of three U.S. Marines – Robert Leckie, Eugene Sledge and John Basilone, as they travel across the the Pacific during World War II. 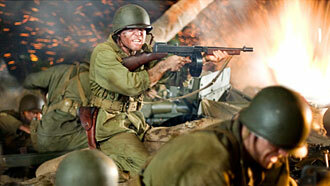 The Pacific tells a different story than Band of Brothers, which focused “Easy Company” of the U.S. Army. From Band of Brothers to The Pacific: Available exclusively to Comcast customers, this special content features Tom Hanks and Steven Spielberg talking about their experiences making Band Brothers and how it led to the creation of The Pacific. Scene from The Pacific: An exclusive-to-Comcast early look at a scene from the miniseries with an introduction by the creators. The Making of The Pacific: This unique cut made for Comcast details the creation of the new miniseries. Trailer: A unique cut for Comcast highlights clips from The Pacific. Profiles of The Pacific: Sneak peek at character profiles of the real soldiers from the war. Band of Brothers: One new episode per week of the acclaimed HBO award-winning miniseries will be available on HBO On Demand in HD leading up to the premiere of The Pacific. The Making of Band of Brothers: This feature details the genesis of the project, its casting and the day-to-day grind the actors endured. Band of Brothers Video Diaries: Ron Livingston follows the actors and filmmakers during the filming of Band of Brothers. We Stand Alone: The Men of Easy Company: A documentary featuring interviews with actual soldiers from Band of Brothers’ Easy Company. dude – war movies are the best kind. so another war movie? didnt we have enough with band of brothers? wonder if theere will be any arms & legs blown off in this one.